3 Most Important Names in Digital Watches | OhGizmo! By David Ponce on 02/02/18 • Leave a comment! Rolex, Omega, Tag Heuer… they’re all big names in the watch industry when it comes to luxury mechanical timepieces, but here at Oh Gizmo? We say, big deal: we want cool, futuristic-looking digital watches with tons of advanced features! For a time, there was a slight shift away from digital watches, but they recently made a roaring comeback with the invention of smartwatches. However, smartwatches wouldn’t be here if it wasn’t for the success of several companies in the 80s and 90s. So, here are some important names related to digital watches. 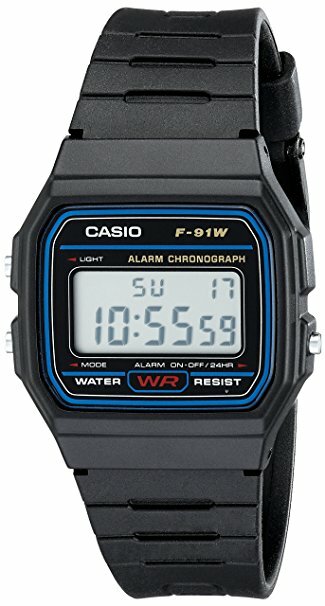 Japanese company Casio is a name most will connect with digital watches, primarily because of the famous F-91W model that took prominence in the 90s. People all over the world absolutely loved the watch, not only due to its simple-but-effective design but also because of the many features. The resin strap was sturdy and comfortable, it was water resistant, there was an alarm and stopwatch, and it also had a cool LED backlight. Casio had a lot of success with their G-Shock range, which was a lot tougher and built for those needing a digital watch primarily for the outdoors. Although Casio does (deservedly) get a lot of the spotlight when it comes to digital watches, it must be said that Seiko was the company to get it all started. In 1973, the Japanese brand created the world’s first LCD quartz-powered digital watch, called the 06LC. With a design fairly similar to the Casio F-91W, the 06LC was very popular and is still much sought-after today. Although the 06LC won’t be easy to find, you might get lucky if you search via an online second-hand watch market. Be sure to also take a look for the limited edition Star Wars watch! We can’t leave Apple out of the list, primarily because the Apple Watch has been so crucial to revitalizing the digital watch industry. It’s designed so beautifully, has more functions than you could ever dream of (heart rate tracker, GPS, and the ability to play music, take calls, play games and send messages) and simply keeps getting better and better. Currently on the third edition, exact sales figures on the Apple Watch are a little hard to come by, but it’s estimated that close to 11.9 million units were sold in 2016, and that 80% of all smartwatch sales were the Apple Watch.